North Yarmouth Academy offers three diplomas with distinction. With each diploma distinction, students learn to take ownership of both their program and their learning. Students in this program develop high levels of musicianship while serving in the local community. They will demonstrate an ability to promote themselves and other musicians, and create a personal media platform. They develop entrepreneurial skills, learn to work with various forms of media, and develop business skills that will serve their lifelong musical and service endeavors. In addition, students in this program will be mentored by a professional musician. 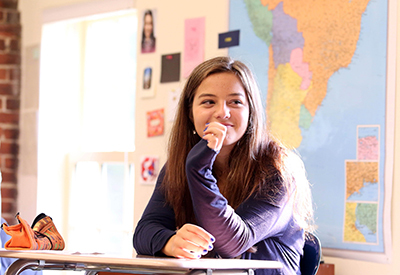 Students in this program are dedicated to foreign language and seek greater global awareness. The program is largely based on individual interest. Students demonstrate near fluency in a foreign language and have an in-depth understanding of another culture. This can be completed through study abroad, self-designed independent study coursework, collaboration with a cultural center, and/or working with immigrant, refugee or bilingual persons. Students show a commitment to service and global citizenship through completing 80 or more hours of service through service projects, and exhibit serious study and scholarship in an area that combines language, global awareness, and service through completion of the Global Studies Seminar and a Senior Capstone Project presented in the spring of their senior year. The distinction in STEM provides a framework for students to build foundational skills in preparation for STEM-related college studies. Recognizing that STEM fields range from all branches of engineering to environmental and medical scientific research to computer programming and technology, the STEM distinction allows students to follow their passion while learning how all STEM disciplines are linked and mutually functional. In addition to completing all NYA graduation requirements, students complete a minimum of four credits of mathematics and four credits in science (which must include a minimum of 1 AP science credit) earning a minimum cumulative STEM GPA of 3.5. 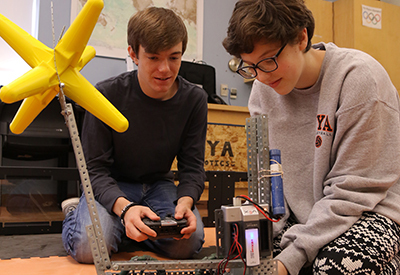 Students also complete specific courses in mathematics, engineering, computer programming, and participate in a Senior Innovations Seminar with STEM concentration and a senior Capstone Project. See our course catalog for more information on our diplomas with distinction.